Read the current edition of the Christian Monthly here! The Christian Monthly is dedicated to the proclamation of the Word of God. Our mission is to preach God's Word, teach the principles of the doctrine of Christ, and reach the world with the Gospel message, proclaiming the Good News of salvation through faith in Jesus Christ. In the Christian Monthly publication, our church members have the opportunity to encourage and uplift one another in the journey of faith and to glorify God for His goodness and grace to all mankind. The Christian Monthly is a publication of the Apostolic Lutheran Church of America. Our Federation of churches stands on the truths revealed in God's Word. We believe in the Triune God: the Father, the Son and the Holy Spirit. We recognize as true, the Christian Doctrine, based on the Old and New Testaments of the Holy Bible, the Lutheran Doctrine, the Book of Concord, and the three ecumenical symbols: the Apostolic, the Nicene, the Athanasian Creeds, as well as the Augsburg Confessions, (those parts) which are in agreement with the Holy Bible, uphold the Confession of True Faith, and love as the greatest law. We maintain the five solas of the Reformation: the Bible alone is the inspired Word of God; justification is through faith alone; salvation comes by grace alone; Christ alone is the Mediator between God and man; and all glory is to God alone. Visit our Federation at ApostolicLutheran.org. Log in to download recent monthly editions. Log in to download recent chidren's editions. 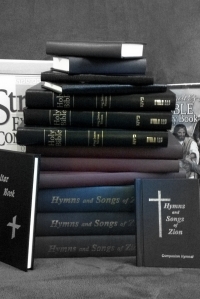 Books, Hymnals and Sunday School Materials produced by our Apostolic Lutheran Church of America Federation.